Notes: Castle is in Orford and is well sign-posted. There is a small dedicated car park for the castle and further parking is available in the town centre just a few minutes walk from the entrance. The Keep built by Henry II surrounded by a confused set of earthworks; some of which might have been generated during removal of stone from the curtain walls. The Keep offers good views of the surrounding area and also has a number of exhibits within. 1. Orford Castle cost £1,413 over the eight years it was built. By contrast annual Royal income was approximately £18,000. 2. Although Orford now just consists of a Keep, it was originally surrounded by a curtain wall that would have been similar in style and design to the Inner Curtain Wall seen at Dover. Built to strengthen Royal control in Suffolk following the Anarchy, Orford Castle was constructed to a brand new design. Completed just in time to withstand the 1173 rebellion against Henry II, it later saw action during the Barons War against King John. Henry II came to the throne in 1154 after a protracted civil war – the anarchy – had been fought between his mother, Matilda, and her cousin, King Stephen. During this war various barons had attempted to play both sides to their own advantage and to keep the reigning monarch weak enough not to impede their interests. 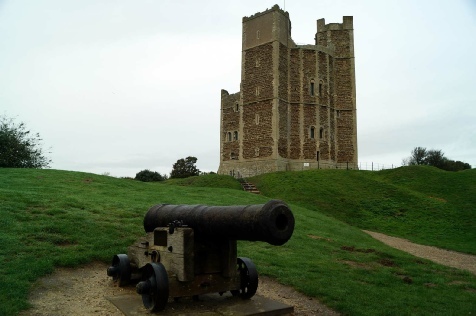 Henry was determined to end this; he strengthened his Royal castles at Carlisle, Dover, Newcastle and Scarborough whilst building a new fortification at Orford in Suffolk. Orford was specifically designed to counter the threat from Hugh Bigod, Earl of Norfolk whose power was centred on nearby Framlingham Castle. In 1157 Henry had confiscated Framlingham and several other castles belonging to Hugh and although several were returned by 1165, Henry clearly felt a Royal garrison in the area would help cement his authority both locally – with Orford sitting in between Framlingham and the sea – and nationally with the castle providing protection to a harbour which offered a safe haven for shipping on-route to Scarborough or the Tyne. Furthermore in 1164, the year before work started at Orford, Henry had quarrelled with Thomas Becket, Archbishop of Canterbury which brought with it a threat of invasion from Becket’s continental allies. For these reasons work on Orford Casle commenced in 1165 and the Keep was complete no later than 1167 although work would continue for another 6 years finishing the outer walls and out buildings. In 1173 Hugh Bigod, Earl of Norfolk joined Prince Henry, Henry II’s eldest son, in open rebellion against the King. Hugh landed Flemish mercenaries near Walton Castle in Suffolk. The strength of the new castle at Orford, which was garrisoned by around 70 men, was such that the attacking army by-passed, rather than attacked, the fortification. The rebellion was crushed with both the rebels, and their supporter Louis King of France, being defeated in battle. In 1174 Hugh Bigod submitted to Henry II with his castles confiscated and destroyed. In the reign of King John, Orford Castle was taken by Prince Louis leader of the rebellious barons fighting against the King. But with the death of John in 1216 and the reversal of military fortunes for the French led rebellion, it petered out and Orford was taken back into Royal ownership. The castle was garrisoned again during the reign of the weak and ineffectual Edward II, but thereafter Royal requirements for it reduced and Edward III sold it 1336 to the Earl of Suffolk. Although used as a residence it fell into disuse until opened to the public in the 1930s.